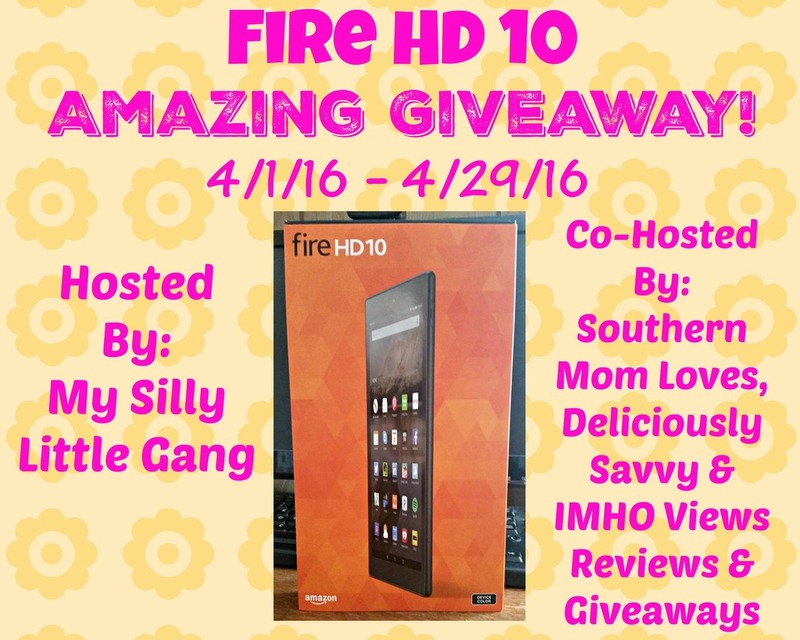 Welcome to the Fire HD 10 Amazing Giveaway! Here is an amazing giveaway that I’m sure you’re going to want to enter, I am giving away an Amazon Fire HD 10 Tablet (ARV $229.99) to one lucky winner! Read below to learn a little more about the product or check it out here. 16 GB of internal storage. Free unlimited cloud storage for all Amazon content and photos taken with Fire devices. Add a microSD card for up to 128 GB of additional storage. This giveaway will run through 4/29/16 at 11:59 pm Eastern Time and is open to US residents ages 18+. Chances of winning depend on entries received. Winner is subject to eligibility verification and will have 48 hours to confirm before a new winner will be drawn. For any questions or concerns please email silvie.mslg@gmail.com (please consider adding this email to your “Safe List” as the winning email notification will be sent from this email.) Please refer to the full terms and conditions in the Giveaway Tools form. This giveaway is in no way endorsed, affiliated or associated with Facebook, Twitter or any other Social Media Networking Site. Thank You for stopping by! We all “love it when you like us” on Facebook! By following us on our social networks and by email we are able to get the best giveaways together on the internet! Disclosure: Participating blogs are not responsible for prize fulfillment. My Silly Little Gang will be providing the prize above to the winner, and is responsible for shipping prize. Thank you for stopping by!